Black lives matter. Full stop. Any discussion of police violence against American lives must begin and end with (and consist of) the experience of black and brown people in our country. If we are to end police brutality, that must be our main focus. It’s not for us to make metaphors, excuses, or pander to nonblack people. Black and brown people are being gunned down in the street, and our job as citizens must be to center on the issues; our activism must not center on our own guilt or our own lives but those of others. I, however, am a hypocrite. I’m about to pander in a big way. This week, I attended a protest in New York City which started at Union Square, organized by NYC Shut It Down, “a multiethnic, multigenerational group of anti-heteropatriarchal activists who fight against militarized policing and racial injustice,” in their own words. “Don’t waste your time arguing with people who don’t believe in the cause,” a speaker had told us at the beginning of the night, “but mobilize your own people.” I paraphrase: words were swallowed in the crush of people, but I was deeply struck by this sentiment. 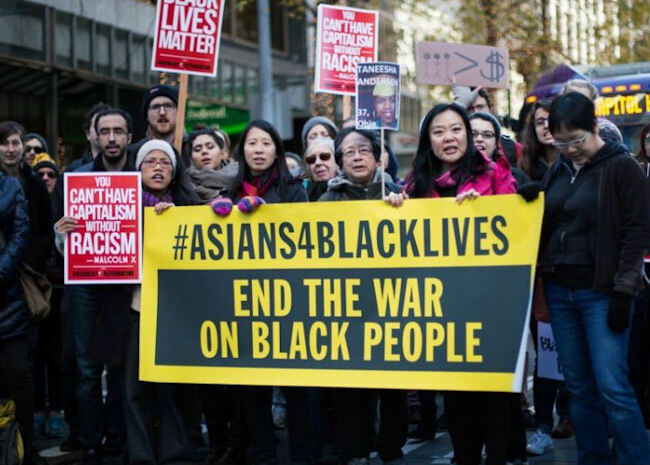 So this essay is for my people: the well-meaning Asian, white, and racially “other” liberals like me, liberals with our hearts and minds in the right place and our actions slow to catch up. It’s for us pandering, guilt-motivated people who cry watching yet another video of police brutality, post “Black Lives Matter” on facebook, and then go about our day, the pain of what we saw dissipating as the hours accumulate. 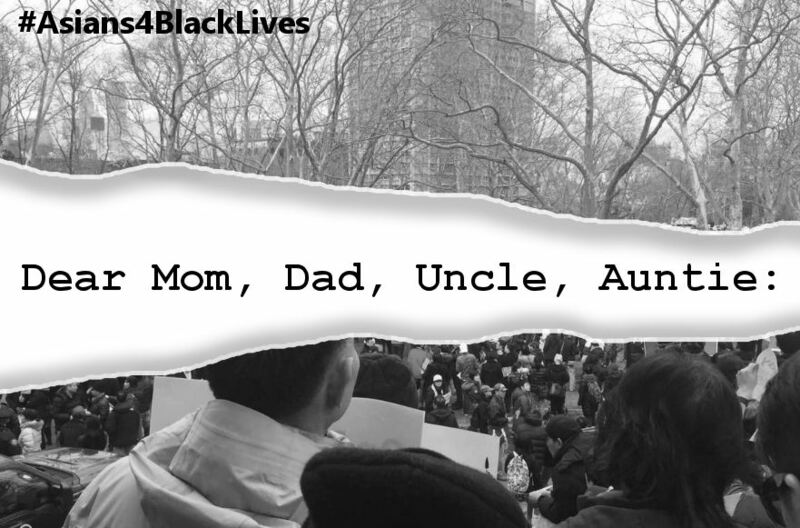 It’s not for people who don’t care about black lives; it’s for those who do. If you don’t already believe in dismantling the system, in righting its institutional wrongs, you can feel free to look away now, to return to your life of ignorance; you are not my people. I first became aware of Minnesota’s outlier status when I lived there between 2002 and 2006. 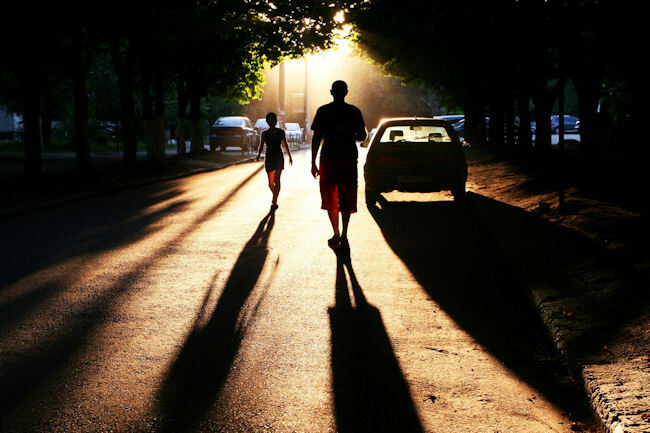 The Twin Cities are vibrant havens for Native American life. Black heterogeneity invites East Africans and African Americans to commune and code-switch across their differences. The infamous anti-communism among Southeast Asians is absent; refugees of the Vietnam War vote for and run for office as Democrats. Minnesota was the lone dissenting voice to back Walter Mondale in the 1984 presidential election, when Ronald Reagan was swept into the White House following ballot box victories across America’s other 49 states.. Throughout much of America’s history, Minnesota has stood valiantly, if understatedly, in opposition to much of the rest of the country. I lived in St. Paul, a half block away from either the right or the wrong side of a gentrification line, depending on how one sees it. Three buildings away, a poorly maintained apartment complex crumbled from neglect by its slumlord owner. An equal distance in the opposite direction stood a house that debuted the market with an asking price of over half a million. Just north, one might find an overpass for Interstate 94, which runs through the bowels of the old Rondo neighborhood. Every year, the predominantly African American former residents of Rondo host a festival to remember their beloved space, and to lament its destruction in the 1960s to make way for an increasingly automobile-centered society. Many of them were (and still are) reliant on public transport, yet they lost their homes to make way for our cars. In this and other aspects, Minnesota is typical—its inequities are congruent with those of the country at large. On July 6, Officer Jeronimo Yanez pulled Philando Castile over during a traffic stop just five miles away from Rondo, in the nearby suburb of Falcon Heights. He had a broken taillight. When Castile reached to present his ID, Yanez panicked and fired five shots into his body in front of his panicked girlfriend and her four-year-old daughter. Castile died shortly thereafter in hospital. The fact that Castile was African American is significant. Numerous studies, historic narratives and contemporary accounts testify to the existence of police aggression targeted at black people — an unbroken thread stretching from slavery to emancipation to the present day. That Yanez—whom Castile’s companion described as “Chinese” in the video she live-streamed of his killing—is phenotypically Asian is also significant. Days after Castile’s death, Yanez’s name and race – he is Latinx – were revealed to the public. Nonetheless, the questions surrounding race and solidarity between Black and non-Black people of color as raised by Philando Castile’s fatal shooting and its aftermath need some parsing. Philando Castile, in an undated photo from social media. Two days ago, police shot and killed another Black man — the latest victim in an epidemic of state-sanctioned gun violence against Black bodies that has already claimed 136 Black lives in 2016. 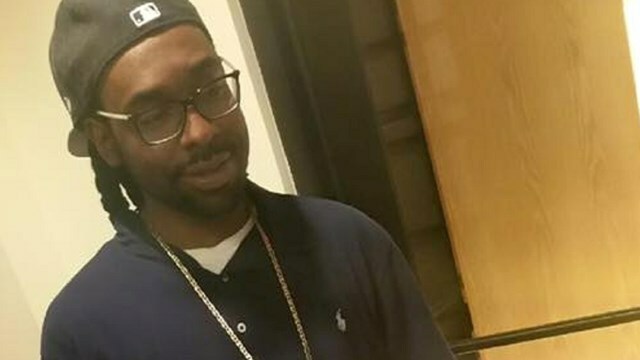 Philando Castile, 32, was driving in a car with his girlfriend Diamond Reynolds and her 4-year-old daughter when their car was pulled over by police in Falcon Heights, Minnesota for a broken tail light. Castile, who was licensed to conceal-and-carry, notified the officer that he was armed and that he was reaching for his wallet to retrieve his ID and registration, as per the cop’s instructions. He did everything that young Black boys are taught to do in the Talk. The officer fired four shots anyways, killing Castile before his horrified family — all over a burned out light bulb. National attention is focused today on Minnesota as we mourn Castile’s death. Unlike the vast majority of Black and Brown men shot and killed by police every day — whose deaths receive scant attention or outrage — we cannot help but be confronted by the pain of Castile’s murder. Just minutes after the still unnamed police officer shot and killed Castile, Reynolds began streaming the killing’s aftermath live on Facebook. An understandably distraught Reynolds broadcast the full trauma of a racialized police encounter turned deadly, using her video to pray, ask for help, and to record important details about the incident. One important detail is Reynolds’ description of the police officer who killed Castile. Recounted from the backseat of a police cruiser while she was still handcuffed, Reynolds narrated in her video that the police officer who killed Philando Castile was a “heavyset” “Chinese” man. That officer was later identified as Jeronimo Yanez, whose race and ethnicity has not been revealed. Frankly, I don’t think it matters if Castile’s killer was non-White, or if he is indeed Asian American. Black lives matter. Black lives matter when a White police officer shoots and kills Alton Sterling on Tuesday for selling CDs in a parking lot, and Black lives matter when a non-White police officer shoots and kills Philando Castile on Wednesday. Black lives matter regardless of the race of the person who takes them. Hours after Castile’s death, Minnesota governor Mark Dayton confirmed that race played a role in the shooting, saying that Castile likely would not be dead were he White. The deaths of Philando Castile and of Alton Sterling — killed less than 24 hours earlier by police for selling CDs in a parking lot — demonstrates the value that society still fails to place on Black lives. 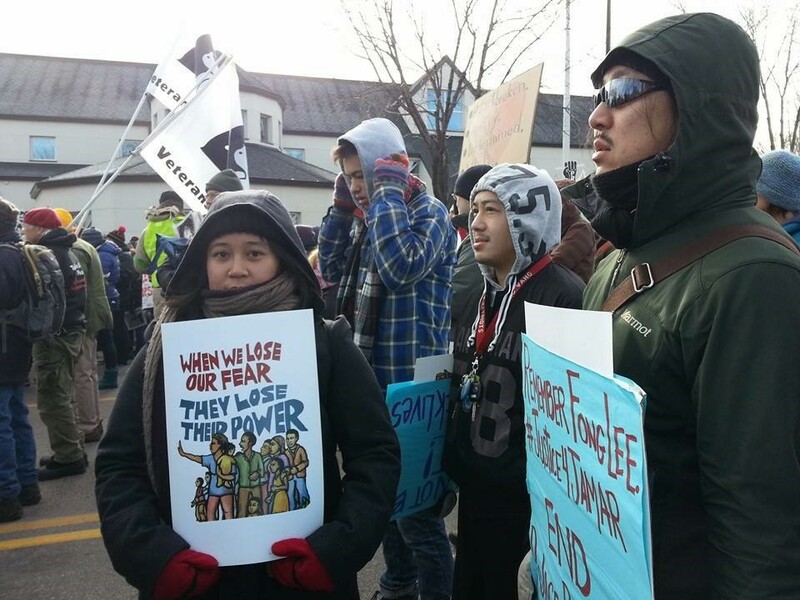 Asian Americans cannot afford to be bystanders in this fight, because this is our fight, too. All of America stands at a crossroads, staring down a quintessential moral choice: what kind of society do we want to live in? Do we choose a society where the lives of Black and Brown people — including Black and Brown Asian Americans — has value? Or, do we continue to uphold a system that places no value in the lives of non-White people, including our own; and wherein only some can place their trust in our law enforcement? What side will we choose?